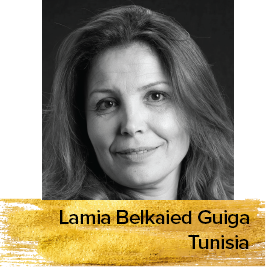 Lamia Belkaied Guiga is a Tunisian film critic who teaches film history & film analysis and directs a Master of Research at the Higher School of Audiovisual and Cinema Carthage University, Tunisia. Lamia is the Artistic Director of the Carthage Film Festival and has been a jury member of several festivals. As a researcher, her research focuses on Tunisian and African cinema. She has her works published in Africultures and the African Women in Cinema blog.